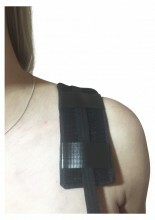 This Magnetic Bra Strap Pad was designed especially for Women as it simply attaches to your BRA Strap! Simply slip under your Bra Strap and fold the VELCRO® Brand Hook over the strap onto the Loop pile to securely fasten the pad. 3 powerful Rare Earth Magnets 2500+/- surface gauss and 13,500 +/- Core gauss. Each Magnet is NORTH facing to the skin, which is the Alkaline field of the magnetic field. We have used the best quality Genuine VELCRO® Brand low profile Hook and Loop for your comfort. We have had reports from our clients who used them and they have had amazing success with them. electro-medical devices should not use magnetic products. Click the button below to add the Magnetic Bra Strap - Black Cotton to your wish list.